Prime Minister Netanyahu spoke today with Prime Minister Erdogan from Turkey. PM Netanyahu said he had seen PM Erdogan’s recent interview in a Danish newspaper and appreciated his words. He made clear that the tragic outcome of the Mavi Marmara incident was not intended by Israel and that Israel regrets the loss of human life and injury. In light of Israel’s investigation into the incident which pointed to a number of operational mistakes, the Prime Minister expressed Israel’s apology to the Turkish people for any mistakes that might have led to the loss of life or injury and agreed to conclude an agreement on compensation/nonliability. 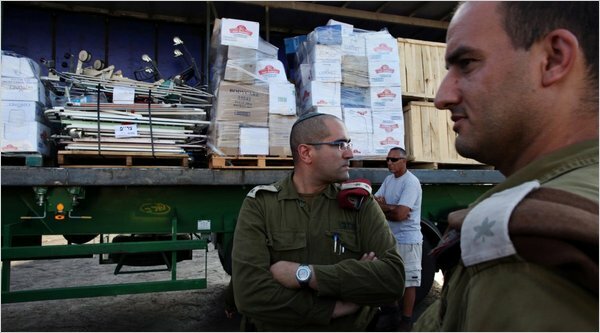 Prime Minister Netanyahu also noted that Israel had substantially lifted the restrictions on the entry of civilian goods into the Palestinian territories, including Gaza , and that this would continue as long as calm prevailed. The two leaders agreed to continue to work to improve the humanitarian situation in the Palestinian territories. ראש הממשלה בנימין נתניהו שוחח היום עם ראש ממשלת טורקיה ארדואן. השניים סיכמו על השבת הנורמליזציה בין המדינות, כולל שליחת השגרירים בחזרה, וביטול ההליכים המשפטיים נגד חיילי צה”ל. ראש הממשלה נתניהו אמר לראש הממשלה ארדואן שהיו לו שיחות טובות עם הנשיא אובמה בנושא שיתוף פעולה אזורי, וחשיבות יחסי ישראל טורקיה. נתניהו הביע צער על ההידרדרות ביחסי ישראל-טורקיה, והביע את מחויבותו להסדרה של חילוקי הדעות במטרה לקדם שלום ויציבות באזור. ראש הממשלה נתניהו אמר שהוא ראה את הראיון האחרון שהעניק ארדואן לעיתון דני, והביע הערכתו לדבריו. נתניהו הבהיר שהתוצאות הטרגיות של משט המאווי מרמרה לא היו מכוונות, וישראל מביעה צער על פגיעה ואובדן חיי אדם. לאור החקירה הישראלית של התקרית שהצביעה על מספר טעויות מבצעיות, הביע ראש הממשלה נתניהו התנצלות לעם הטורקי על כל טעות שיכלה להוביל לאובדן חיי אדם, והסכים להשלים את ההסכם על פיצויים. ראש הממשלה נתניהו ציין גם שישראל הסירה כבר מספר מגבלות על תנועת אזרחים וסחורות לכל הטריטוריות הפלסטיניות, כולל עזה, והדבר יימשך כל עוד השקט יישמר. שני המנהיגים סיכמו להמשיך ולעבוד על מנת לשפר את המצב ההומניטארי בשטחים הפלסטינים. Israel will not “take responsibility” for the deaths of nine Turkish nationals by apologising to Ankara over its botched 2010 raid on a ferry heading for Gaza, a senior cabinet minister said on Thursday. “We are not ready to apologise, as apologising is taking responsibility,” Strategic Affairs Minister Moshe Yaalon told reporters in Jerusalem. “There is no room in my mind for any kind of apology that means taking responsibility,” he said of the pre-dawn raid on a six-vessel flotilla that attempted to sail to Gaza in May 2010 in a bid to break Israel’s naval embargo. Yaalon’s comments come after several failed attempts by Israel and Turkey to patch up ties that frayed almost to breaking point after commandos stormed the Turkish-owned Mavi Marmara ferry that was leading the flotilla. He said Turkish representatives continued to insist that relations could only be restored if Israel apologised for the raid, compensated the families of those killed and the injured, and lifted its blockade on the Gaza Strip. “We tried very hard to bridge the gap … (but) as long as they insist on this position I can’t see any agreement between the two sides,” he said. “We are ready to regret the loss of lives, we are ready to create a kind of humanitarian voluntary fund,” he said, explaining that if such a fund were set up by Ankara, Israel would be prepared to pay money into it. But he said there would be no official apology nor direct compensation offered to the families of those killed and the injured. Israeli Foreign Minister Avigdor Lieberman has repeatedly said the Jewish state will not apologise for the raid, although privately officials acknowledge that upgrading relations with Ankara would be desirable. Israeli President Shimon Peres thanked his Greek counterpart, Karolos Papoulias, for his country’s help in stopping a flotilla bound for Gaza. Peres hosted Papoulias on Monday in Jerusalem for a reception and a working meeting. “I genuinely thank you for fulfilling the directives of the Secretary-General of the United Nations by stopping the flotilla,” Peres told Papoulias. “I thank you for not allowing people interested in violating the law and disrupting order to reach Gaza, which is ruled by a terror organization. He also thanked the country for sending firefighting planes and firefighters to help in extinguishing last year’s Carmel forest fire. During their meeting the two leaders discussed strengthening relations between Greece and Israel in a number of areas, particularly diplomatic and trade relations, Peres’ office told journalists. The Greek coastguard escorted a US boat seeking to join the Gaza flotilla back to port and said it will stop all other attempted departures. It looks like a big diplomatic victory for Benjamin Netanyahu. A pro-Palestinian activist plays a trumpet as others hold banners on their boat named ‘Audacity of Hope’ moored in Perama, near Athens Thursday. A boat carrying a contingent of US activists seeking to join a flotilla of protesters against Israel‘s blockade of the Gaza Strip were turned back by armed Greek commandos about 30 miles out of Athens today, in a major blow to the group and an apparent diplomatic victory for Israeli Prime Minister Benjamin Netanyahu. Canada’s foreign minister has “strongly” urged against Canadian involvement in an international aid flotilla slated to leave for the Gaza Strip in late June. “I strongly urge those wishing to deliver humanitarian goods to the Gaza Strip to do so through established channels,” Baird said in a statement issued May 28. Baird’s warning comes amid reports that an umbrella group representing about 100 Canadian organizations says it is planning to send a Canadian boat, named the Tahrir, to the Gaza Strip as part of the second international Freedom Flotilla. The foreign minister’s words come nearly a year after Israeli Navy commandos stormed the Mavi Marmara, the flagship of an international aid flotilla bound for Gaza, killing nine Turkish activists and drawing worldwide condemnation. This time, the flotilla is to comprise some 15 ships from several countries. A more “legitimate and constructive” way to help the people of Gaza, he suggested, is to donate to the International Committee of the Red Cross/Red Crescent. The decision by Israel to participate in the U.N. probe of the Turkish flotilla incident marks a stark departure from Jerusalem’s practice of opposing the world body’s investigations of Israeli actions. A year-and-a-half ago, faced with a similar decision when the U.N. Human Rights Council decided to appoint a fact-finding mission to investigate Israel and Hamas’ actions during the Gaza war, Israel boycotted the inquiry led by retired South African judge Richard Goldstone. Israel would pay a heavy diplomatic price: The Goldstone report was harshly critical of Israel and generated months of negative publicity for the Jewish state. A year later, Prime Minister Benjamin Netanyahu is taking the opposite course with the U.N. review panel looking into the May 31 flotilla confrontation. Nine Turks, including a dual Turkish-American citizen, were killed in the melee that ensued when Israeli commandos tried to board the Mavi Marmara, part of a flotilla of ships sailing for Gaza in a bid to break Israel’s blockade of the strip. The incident drew worldwide condemnation of Israel. Giora Eiland’s conclusions on the takeover of the Gaza-bound flotilla are as ineffectual as those he provided four years ago after investigating the abduction of Gilad Shalit. Every four years Maj. Gen. (res. ) Giora Eiland is called to the flag. He retrieves his general’s epaulets from storage, squeezes into his fatigues and sets out to investigate the army. The results are fairly similar. His conclusions on the takeover of the Gaza-bound flotilla, released yesterday, recall those he provided four years ago this week after investigating the abduction of Gilad Shalit: a clear and detailed analysis identifying numerous mistakes, and no recommendations regarding the individuals involved. Eiland describes a series of mistakes, but none reflecting dereliction of duty. There were not enough soldiers on deck to face off against the violence of the Turks and the unpredicted magnitude of their opposition. The naval commandos who arrived by boat were met by violence (including live fire ) that stopped them from boarding, leaving the 15 commandos who had slid down ropes from a helicopter at a disadvantage. Coordination problems among intelligence agencies created gaps in information before the operation started. The navy, according to Eiland, did not properly consider alternatives to the original plan. It was not clear under what circumstances a decision could be made to delay the operation (for instance, an encounter on deck with activists armed with axes and clubs ). After all, the operation was taking place a few miles from Israel’s shores. Tel Aviv was in no immediate danger. The report also reveals that Chief of Staff Gabi Ashkenazi had warned in a letter to government officials on May 13 – two and a half weeks before the operation – that the military option should be a last resort. Ban proposes investigation despite establishment of Terkel Committee. Israel responded coolly Wednesday to indications that despite the establishment of the Terkel Committee to investigate the Gaza flotilla, UN Secretary General Ban Ki-moon was still considering the establishment of an international panel to look into the May 31 IDF raid. Ban’s office proposed the idea at a closed-door meeting of the UN Security Council on Tuesday, and a spokesperson in his office said the office was currently involved in talks to determine the potential leadership of such a commission. Both Israel and Turkey would be encouraged to actively participate in the panel, representatives of Ban’s office said Wednesday. “The secretary-general is in discussions with different parties to see whether an inquiry with credible international involvement can be accepted by all,” the spokesperson said. His message that Israel was exercising its right to self- defense when naval forces boarded an aid flotilla, an operation that left nine pro-Palestinian activists on one ship dead, resonated with Nechama Perelman, a 23-year-old tax adviser. A poll of Israel’s Jewish population by the Maariv daily published on June 2 found 94.4 percent of respondents agreed it was necessary to stop the vessel, and 89.1 percent said Netanyahu shouldn’t resign over the matter. The opposition Kadima party has supported the government on the issue, and Netanyahu’s coalition has shown no signs of strain over the incident. Israel faced rising international pressure on Tuesday to ease its blockade of Gaza, as the United Nations Security Council called its approach to isolating the coastal strip “not sustainable” and pro-Palestinian groups planned fresh attempts to test the closing of sea lanes around the Hamas-controlled territory. A day after an Israel military raid on an international flotilla trying to breach the blockade left nine foreign activists dead, Egypt, an important partner for Israel in keeping tight control over the flow of goods into the territory, said it would open the land border with Gaza for humanitarian purposes.